Children leaving UNRWA school in the late afternoon. Shatila Palestinian refugee camp, November 2016. Let me tell you about a recent Saturday night and working part-time at a wine bar. It’s a good part-time job which helps me stay afloat financially. Whatever it takes for me to continue to serve Palestinian refugees, I’ll do it. Plus, I get to drink wine while I work and meet interesting people, not a bad gig. The other night a group of older, in their 60s, women came in and ordered white wine. They talked loudly about their Christian faith, loud enough that the entire wine bar could hear their conversation. They talked about the resurrection and Revelation and how important it is to show their faith to the world. I smiled as I overheard some parts of the conversation as it was all too familiar to me. The interesting part is how they treated me. I don’t look like a good Christian and it’s quite possible I don’t act like one either -- that’s for damn sure. It’s also possible that many Christians might look at my life and wonder how I call myself a Christian at all. But I do. Because despite all the institutional stuff about the church that I loathe – patriarchy, misogyny, high school popularity contests, Christianese, spiritual and sexual abuse, and mostly the protection of the institution over the individual - I love Jesus. Like lots. That love has changed my life. But at the same time, I am having a very hard time with the American church and its disconnect. It was interesting because I watched them study me and look me up and down and maybe make assumptions about me. When it was time to pay, one lady pulled me aside. She told me she had just come from church and the pastor talked about generosity. So, she needed to be generous and pay for the group. Ok, that made my job a bit easier, one bill. She then turned around and tipped me 10%. It made me crank my head a bit and think of a quote from the Princess Bride, "You keep using that word. I do not think it means what you think it means." Maybe, it was the mini-sermon on generosity she gave me or maybe it was the complete disconnect from her words to me and her actions toward me that bothered me. Most definitely, it was the 10% tip after I gave excellent service. What I wanted to say to her was I learned something about generosity, not in the church here, but in a place that might surprise you. Also, I know something about the Christ child, that He and generosity reside in a Palestinian refugee camp. Yes, you read that right. 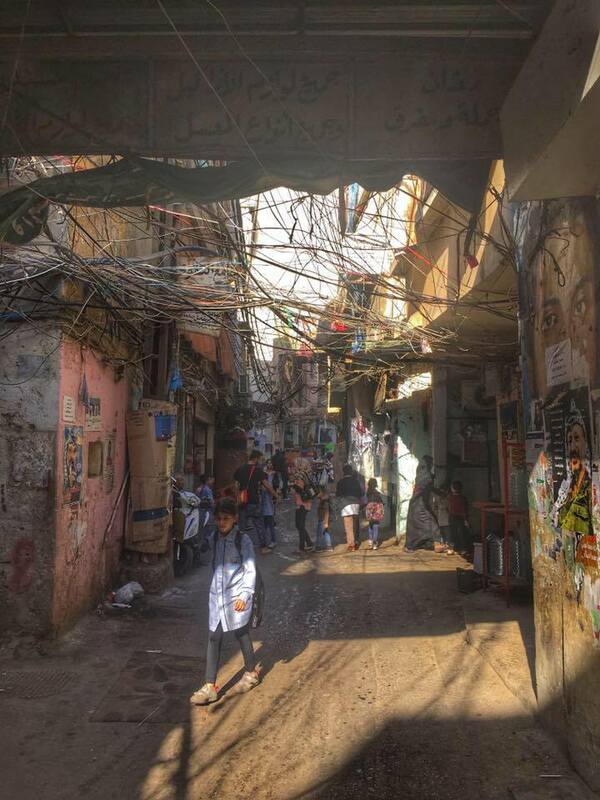 A Palestinian refugee camp. A place full of despair and violence and poverty and beauty and teeming with LIFE. I have worked with marginalized people for over 20 years now. I decided when I became a Christian, I wanted my life to mean something. I had been abused as a child and had cancer as a young woman. It hadn’t been the best life up until that point. What has given my life meaning, great joy, and motivates me to get out of bed every day is the thought that maybe I can make this world a little bit better. Especially those the world marginalizes, those we think less of, those we despise. It is a constant challenge to me of who I see as God’s child and who I don’t. Early on in my Christianity I had a powerful thought, maybe it was God speaking to me, maybe it was an internalization of reading the words of the Bible. God’s glory resides in the person in front of you. Period. No exceptions. I’ve learned a great deal about generosity from Palestinian refugees, from those born without the basic rights I so freely enjoy. I have experienced their hospitality and care. I am invited into stranger’s homes for tea and without a second thought. I am invited for meals, where they serve me the best of what they have. Plates and bowls of delightful Palestinian food carefully arranged upon newspapers spread on the floor. We sit on the floor for hours and talk as we eat. The meal is followed by tea and dessert followed by coffee and fruit followed by chocolates. Sometimes on repeat. They don’t give out of wealth or their reserves, they give what they have. The best of what little they have, they share. It’s a humbling experience to go to help and serve and GIVE and instead be given to so freely and so extravagantly. I guess that’s what I consider generosity to be -- to give to others all you have, not out of your reserve or out of your abundance, but out of exactly what you have to the person in front of you. If you haven’t read Fr. Greg Boyle, I highly recommend his books. One of the most important things he writes about, that I resonate with, is where he finds Jesus. For him, it’s with gang members in L.A. For Henri Nouwen and Jean Vanier, it’s with the mentally disabled. For Mother Teresa, it’s with the poor in India. All of them talk about how they have seen and learned about God’s love with people in the most unexpected places, all with great passion and great humility. I guess the 10% tip left me thinking about disconnect. This woman’s disconnect to me. But, also what we (this includes, me, you, the church, and corporately as a society) disconnect from. Who we think is worthy of help and generosity. How do our actions disconnect from our words and beliefs?